Tens of thousands of Gaels came to Eastern Nova Scotia and Cape Breton in the 18th and 19th centuries. Settlement and living in these new conditions proved difficult for most. Many came from treeless islands and were greeted, upon reaching Nova Scotia, with forests that stretched from the top of the hills down to the sea. The climate was different from that of Scotland - summers were hotter and winters colder, with deep snow that would not have be found in Scotland. Even the fauna was different. Bears plagued farmers by killing sheep and various kinds of biting insects made working outside in the summer months particularly annoying. 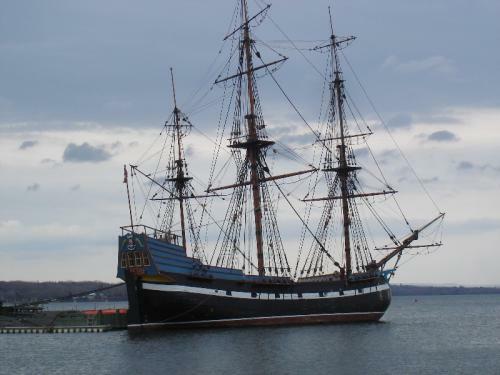 Replica of the ship Hector in Pictou Harbour. The ship "Hector" brought the first group of Gaels from Scotland to settle in Nova Scotia. They set sail from Ullapool in early June and after an almost 4-month journey arrived in Pictou. The journey was an especially difficult one. Disease broke out and 18 lives were lost - mostly children. Barely enough food was packed to feed the 189 people on board and a storm off Newfoundland blew the ship off its course, causing the journey to last an extra two weeks. One man had been collecting moldy bread crumbs throughout the journey and was able to share them with other passengers when the food ran out. The passengers of the Hector had been promised a year's supply of food and materials for building upon their arrival, but these provisions never appeared. The Gaels, having landed in the Fall, had to scramble to build basic shelters for the long winter ahead. They were helped greatly by the Mi'Kmaq who taught them traditional hunting and fishing techniques. John MacLean, also known as Iain Mac Ailein (John the son of Allan) or the Bard MacLean, came to Nova Scotia in the year 1819 from his native island of Tiree. He trained as a shoemaker and worked in Glasgow, Scotland, and briefly served in the military before returning to Tiree where he continued to work as a shoemaker and merchant. He was official bard to Hector MacLean, the Laird of Coll, and is considered to be the last poet to have been employed by a Highland chieftain. Traditionally, a "bàrd" was someone who was paid to compose poems in praise of members of the nobility, their accomplishments and family history. Bards were important in Gaelic society as they recorded historical events, family relations and the relationships between clans. Through time, the term "bard' came to mean anyone who composed songs. Gaelic poetry has always been sung, but very few Nova Scotia bards received payment for their poems. 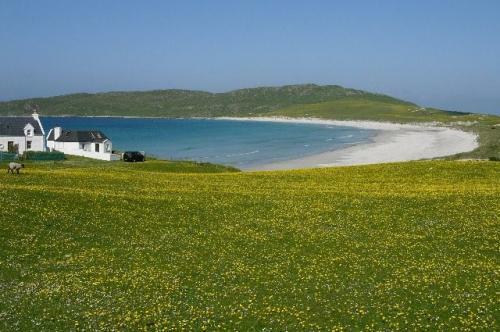 We don't know why John MacLean decided to leave Scotland, but it has been said that he was told that people could become very wealthy in Nova Scotia; that the land and weather were much better that what could be found on Tiree. John settled in Barney's River, Pictou County, where he built a log cabin. Life In Nova Scotia was much more difficult than he had imagined, and his disappointment led him to compose one of his most famous songs, "A' Choille Ghruamach" (The Gloomy Forest). My mind wanders, I cannot raise a tune. With nothing better than the bare potato. And my strength failing before the children grow. As the sad forest awakened yesterday. John MacLean did eventually come to appreciate his new home and moved to Glenbard (named for the Bard MacLean) in 1831. In Nova Scotia, MacLean owned land and was amongst fellow Gaels. Here is part of a song he composed in praise of his new home, which is still sung today. Being held by the Gaels in early Spring. Remember the qualities of the heros! Who would remain strong in troubled times. A "ball" is a dance party. Heather is a rough plant with small purple flowers that covers much of the Scottish Highlands.